This week we have a 'reprise'...Ann's been with us for eons, it seems, back from the very beginning ... and we featured her on our very first blog — and that content is long gone. We thought it's high time to have her pretty cards shown off again! How long have you been stamping? To be honest, I do not remember. It seems like all my adult life. But for sure, over 10 years if not longer off and on. The past four years I have done it on more consistent bases. 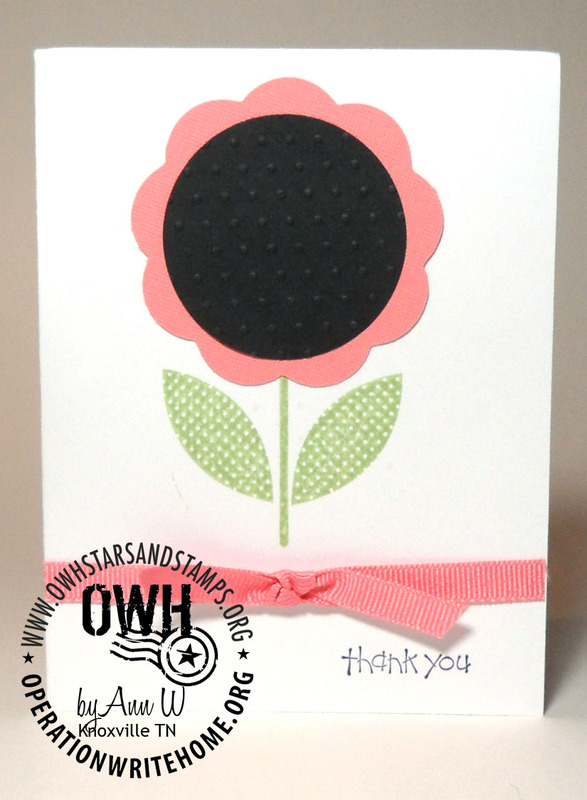 For example, I have made over 5000 cards in the past few years for OWH. Yes, I am addicted. What are your favorite stamp products? One of my favorite patterned papers is Die Cuts with a View. My favorite stamps are Stampin’ Up. I am also partial to anything I can buy using a coupon J. Do you have a favorite technique? I love to use ribbon on cards. While I am not sure about techniques, I can CASE with the best of them. So if you see a card that might be yours, please let me know so I can give credit where credit is due. Are there colors you love to include on your cards? My favorite color is black. 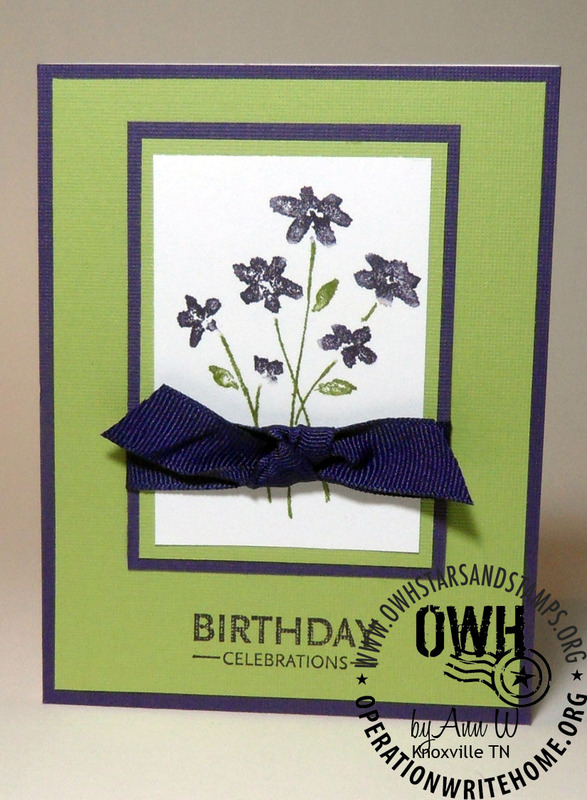 While that is not always appropriate for all cards, I love to use pink or green or yellow with some splashes of black. Most of the time, the colors I use happen to be the cardstock I have handy. 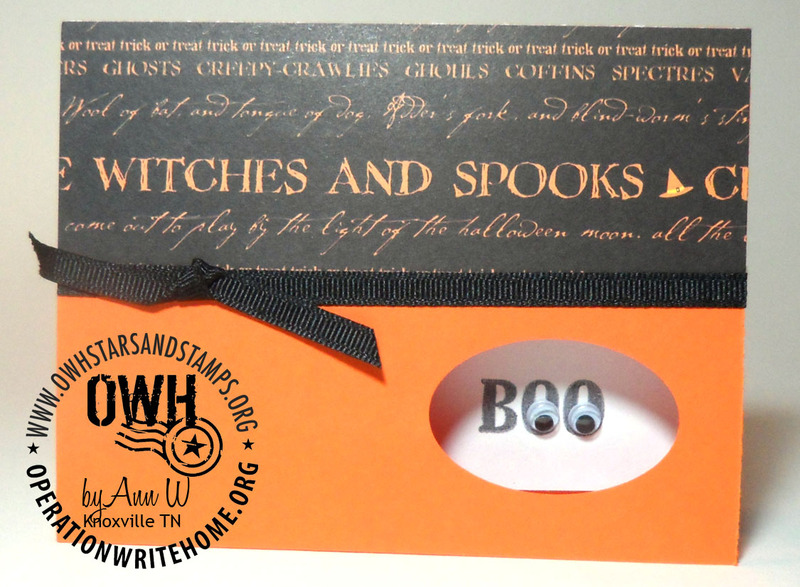 How did you hear about Operation Write Home? I first heard about OWH when it was Cards for the Heroes and then it was on the Two Peas in a Bucket message board. WOW, how it has grown! What motivates you to make cards for our heroes? My step-father was in the Korean War. My uncle was in the Air Force during the Berlin Crisis. I still have two postcards he sent me – I was 12 at the time and it was really a big deal for me to get something sent from Germany. Lots of my high school peers served in the Vietnam War and I remember writing to some of them. Now my niece’s boyfriend is deployed to Camp Leatherneck in Afghanistan until late fall. So I truly understand the importance of communication between the military and their families and friends. I feel honored to be able to contribute my talents to support the troops. After all, they are what keep the red, white, and blue waving over all of us. Well Ann - I'm going to tell you right now - I'm going to CASE ALL your cards. Especially love the Halloween one. Soooo cute. Thanks for sharing. Ditto mumgranny. I am also going to CASE all your cards. I already have plans for an oval cut out card that says Hi. Great cards! Thanks. Nice to meet you Ann! Your cards are beautiful, thank you so much for being "interviewed" again so we who are newer could see your cards and meet you! Love your take on things and your cards are beautiful and it's so nice to meet you. So nice to meet you, and see your wonderful cards.... you've given me and many others some real MOJO now to CASE them! Thank you, thank you! Ann, I love all your cards their just great. I live right down the road in Cleveland, TN. Hopefully we can meet up sometime and do a OWH event together.